The technology is changing rapidly with the advent of cloud, data and AI in it. Innovation in the technology acts as a breakthrough for organizations to accelerate the transformation that drives their businesses. Migrating applications and data to the cloud is one of them. Microsoft Azure promises to deliver a consistent and the global platform for hybrid cloud for all the user applications and data. The flexibility to maintain the consistent hybrid cloud environments, while offering a rich choice of migration and advancement options helps Microsoft Azure cloud services to stand out among the best. The consistency is wholly responsible for distributing your applications and data workloads according to your terms, without the need of maintaining complex skill sets, systems, and tools required while extracting the insights from data to drive innovation. Let us learn about moving your SQL Server and open source applications and data to Azure cloud. It is now possible to move any SQL Server application to Azure without changing any application by using the new deployment option Azure SQL database, Managed Instance. Managed Instances are used for delivering full engine compatibility with the existing SQL Server deployments that comprise capabilities like SQLAgent and Change Data Capture. These capabilities are built-on SQL Database service that itself is highly productive. It is very exciting to discover the differentiated values and services provided by Azure cloud services as compared to other products available in the market. Even though the services include fully managed instances, built-in HA, and semi-autonomous database functionality having performance monitoring and tuning and threat detection that serves as an alarm system for the database, Azure cloud services make sure they deliver the best. Microsoft is expanding the Azure Hybrid Benefit program after launching the SQL Database Managed Instance. This program includes support for SQL server. Users can also move their on-premises SQL Server licenses with Active Software Assurances to Managed Instances. Microsoft Azure is also working effortlessly to provide its users with the benefit of moving their SQL Server Integration Services licenses to Azure Data Factory at a discounted price which will save the users up to 30% of their budget. It is helping the users in developing, deploying and managing their applications and data with lots of ease and cost-effectiveness. Since Microsoft Azure is considered as a one-stop solution for the migration solution to your applications and data, it simultaneously provides full support for open source-based workloads too. You just need to provide your .jar or .war files to App services and it takes care of the tasks related to capacity provisioning, server maintenance, and load balancing. Users are allowed to build their own Docker images if using Jetty and different version of JRE. Overall, open source supported services on Azure make it extremely easy for various organizations to move their workloads to the cloud without causing any disruption to their technology stack and developer culture. These services help to make Azure the best solution for all the apps, data, and infrastructure needs. Data migration using Microsoft Azure cloud services as a platform helps the users to plan cloud migration with great confidence. 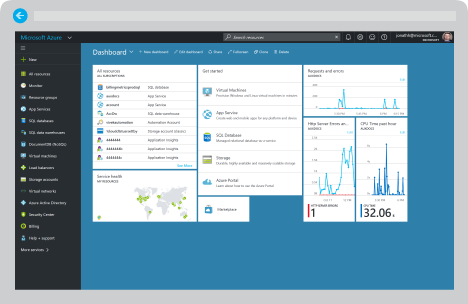 Microsoft Azure cloud services provide rich insight, right-sized resources, and cost estimates that turns out Azure as a single place to discover and assess the premises workloads of users. Our team of IT professionals at i2k2 Networks provides managed Microsoft Azure Cloud Services in India. Contact us at +91-120-466 3031 / +91- 9711774040, or request a callback. Feel free to fill out the contact form and help us to reach you.